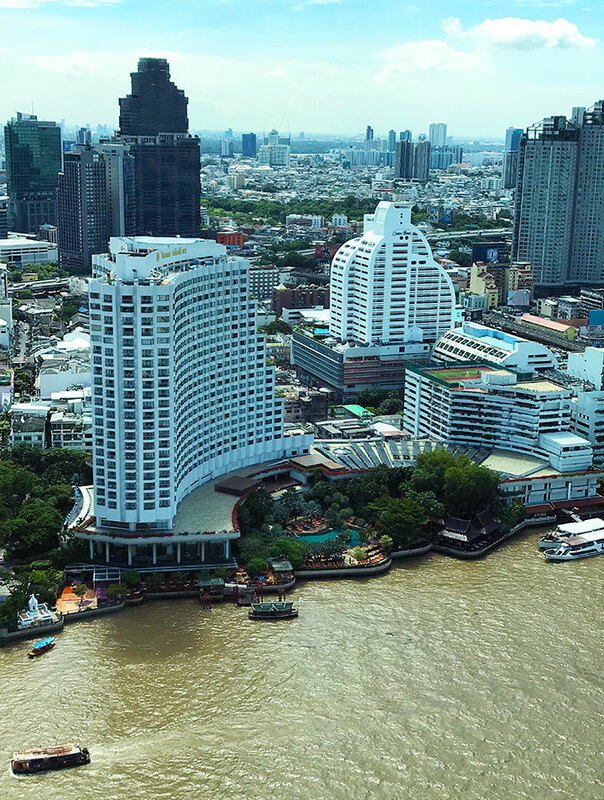 Shangri-La Hotel Bangkok is situated on the lifeblood of the city, the Chao Phraya River, a relaxing and vibrant part of Bangkok. 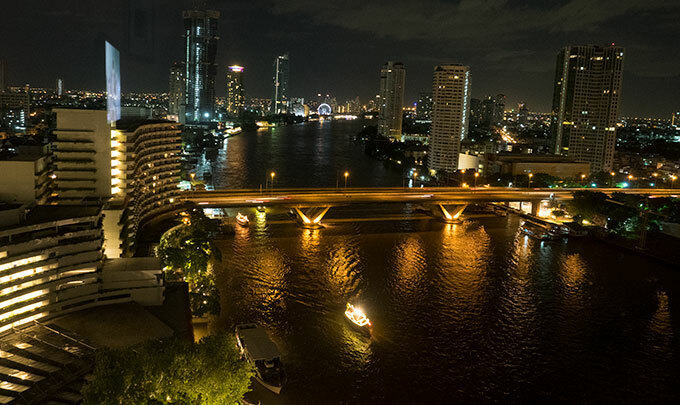 Bangkok is a vibrant city and you are spoilt with choice of where to stay. Mind you, it isn’t an easy decision. Do you stay in the chaotic and vibrant Chinatown? 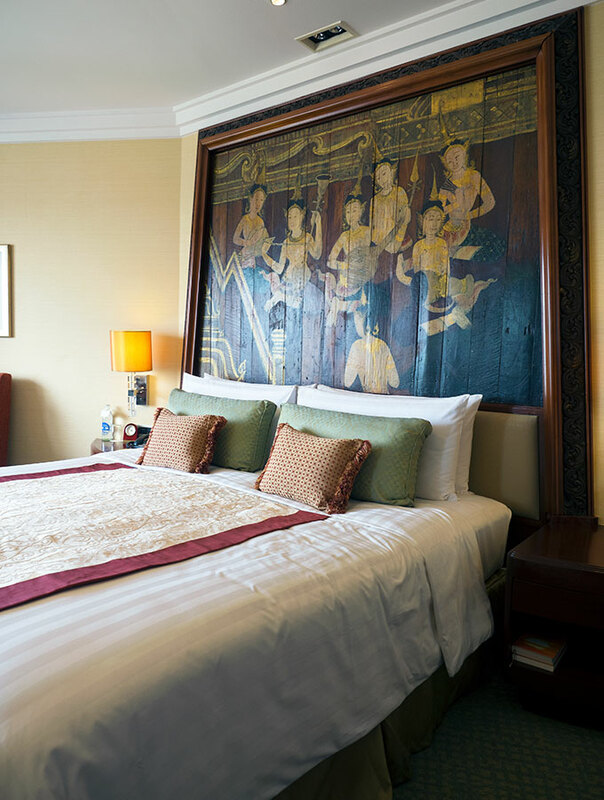 Or choose Ratanakosin where you are close to the major tourist attractions of Bangkok. Are you a night owl? Then may be Sukhumvit would be perfect for you. And don’t let me get started on the shopping! These are all places I love spending time during my time in Bangkok. But when it comes to my “base camp”, I want somewhere I feel relaxed with some breathing space, but is conveniently located. 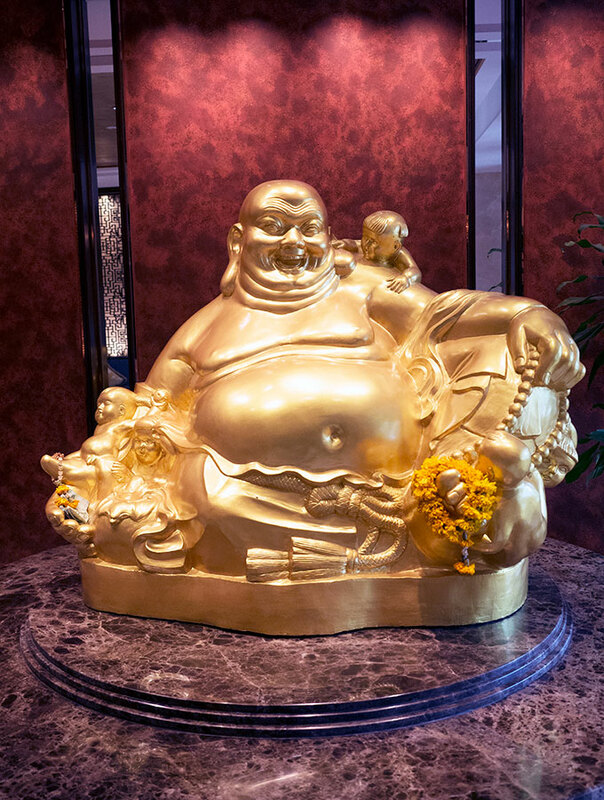 Shangri-La Hotel Bangkok offers this and is a great place to hang your head. Gorgeous grounds, right on the river and is right next door to the BTS Station. 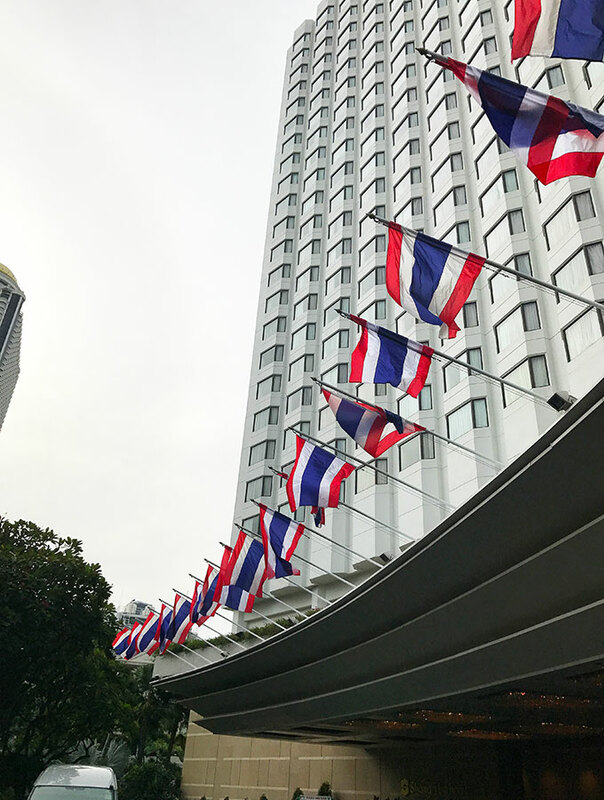 We arrived by taxi, turning off the main drag and then gliding down a couple of smaller suburban streets until you reach the Shangri-La Hotel Bangkok. 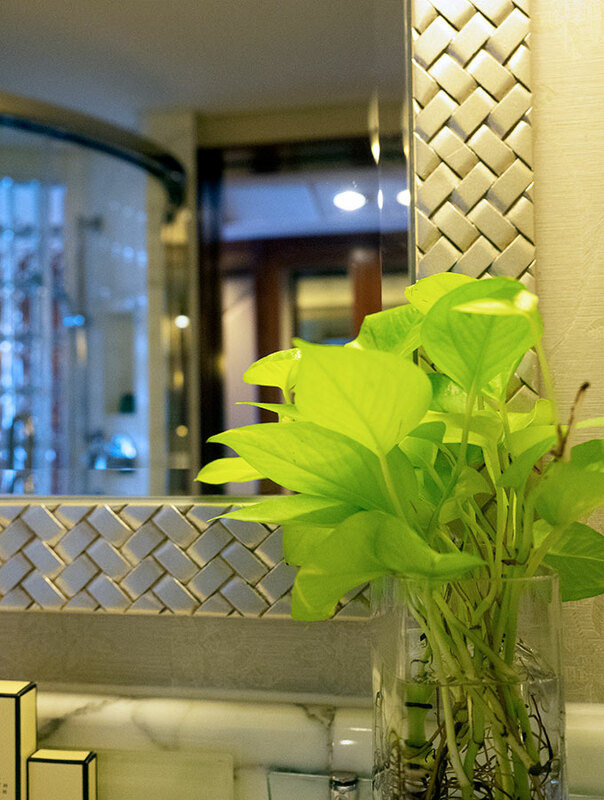 You will be taken care of the moment you arrive, warmly greeted and bags taken care of. There is security to navigate before entering the hotel. It is like relaxed airport security screening. After my stay in Manila it didn’t faze me. But if you are a guest who hasn’t experienced this before, it may be a little bit of a shock. Sadly it is a sign of the times and the staff make you feel comfortable as you go through the process. 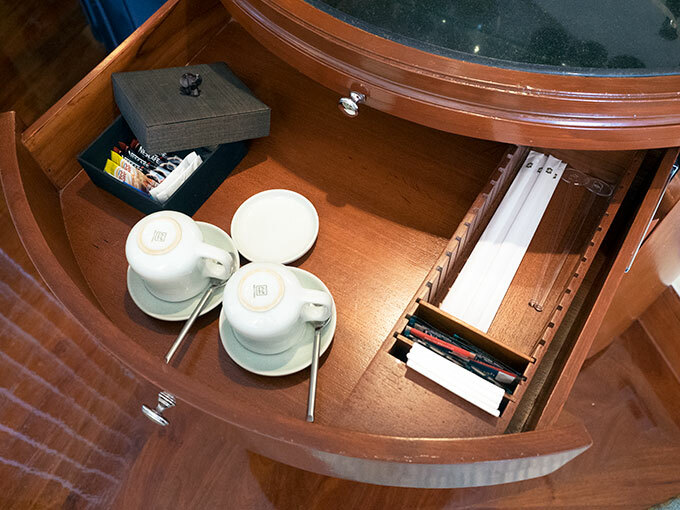 Whilst you check in do take a look behind the reception desk. There is a stunning piece of silk printing artwork. Wooden printing block and printed silk, so gorgeous. We stayed in a Deluxe River View Room, which is bright, airy and spacious. 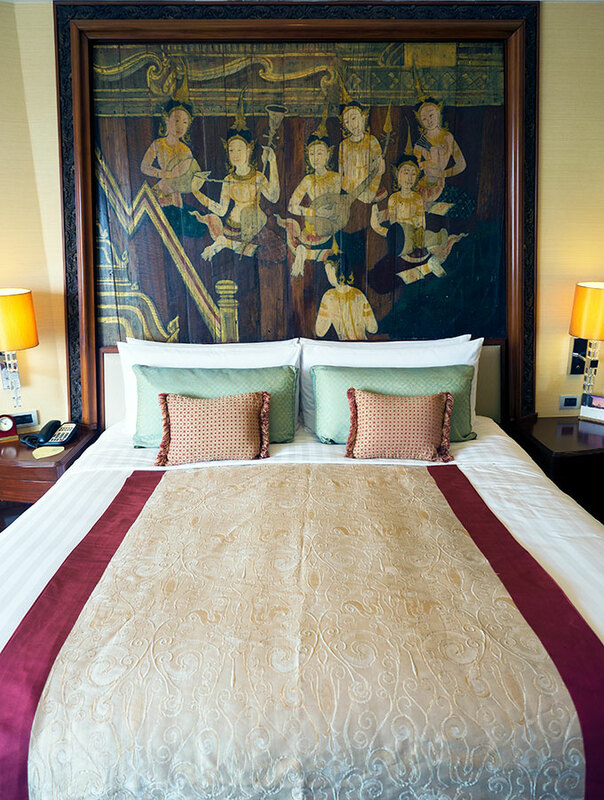 The first thing you notice when you walk in is the king size bed and the grand and stunning bedhead. 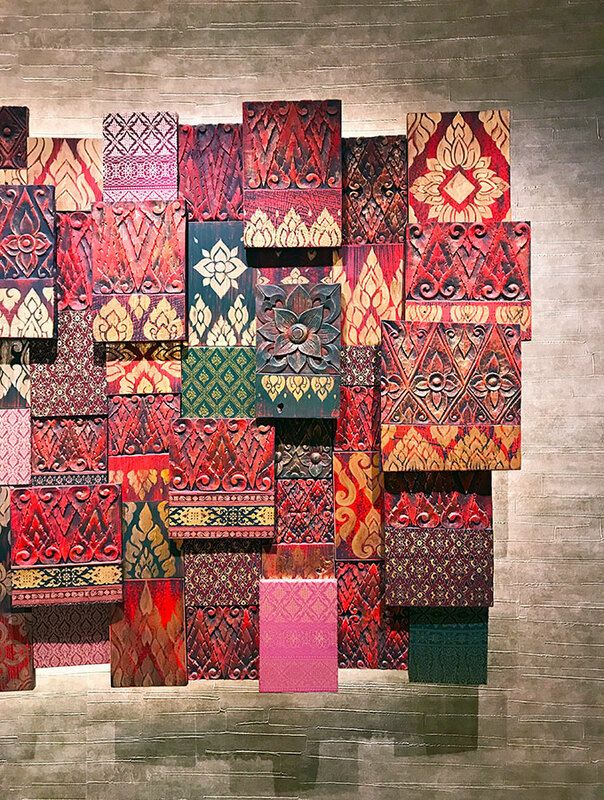 It is a wooden painted piece of art making its presence felt in the room. I instantly want it for my bedroom at home and then realise that even my lounge room would have a hard enough time accommodating it. 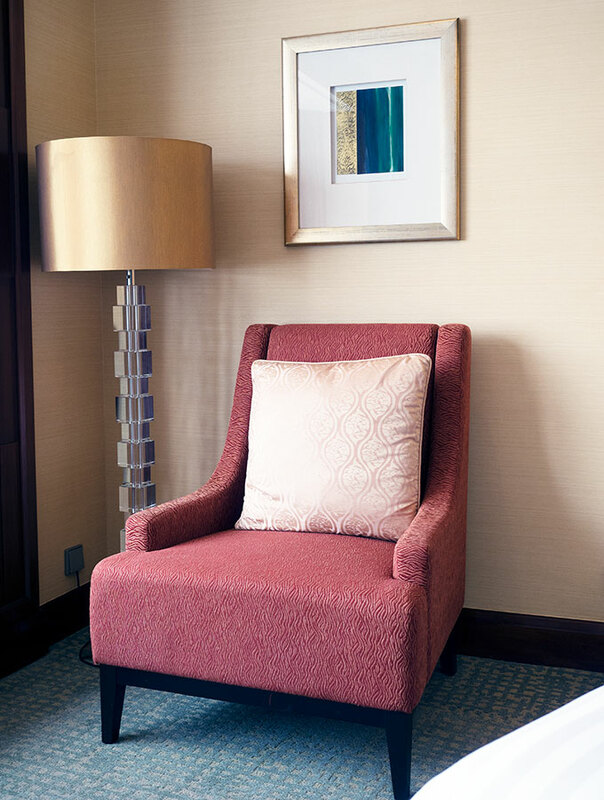 Also in the room there is an armchair to sit and chillax in. But to be honest, most of my downtime in the room was spent on the window box “lounge” that runs the length of the room. 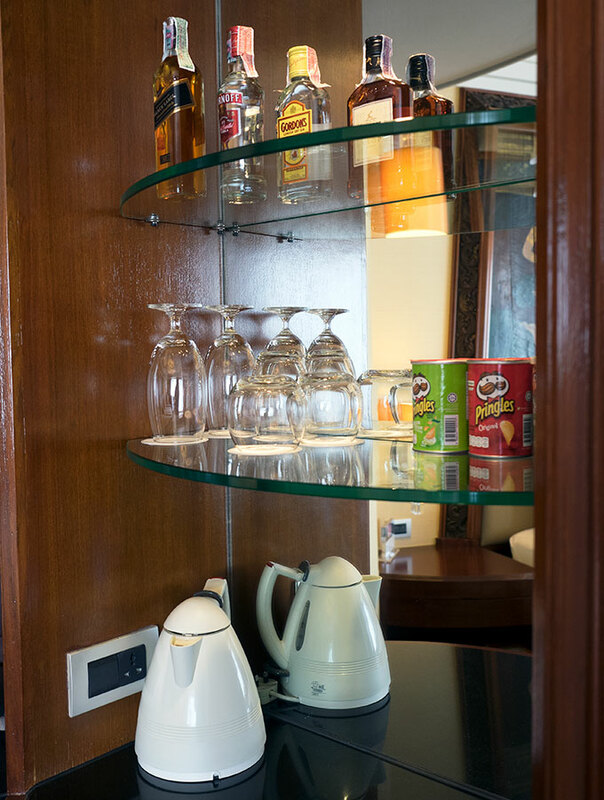 The mini bar is reasonably stocked with soft drink, mixers, beer and juice. 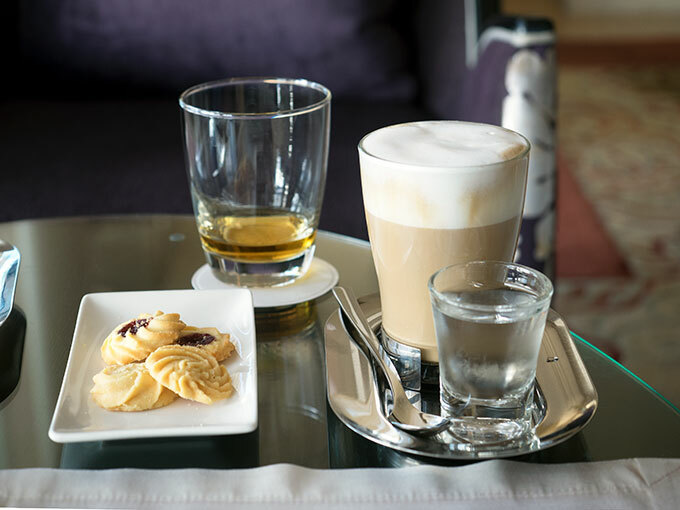 Coffee and tea if you desire and a few snacks. For those here to work, there is a very large desk to accommodate you. Head back to the front door and you will eventually notice the bathroom that you bolted past to look at the view. 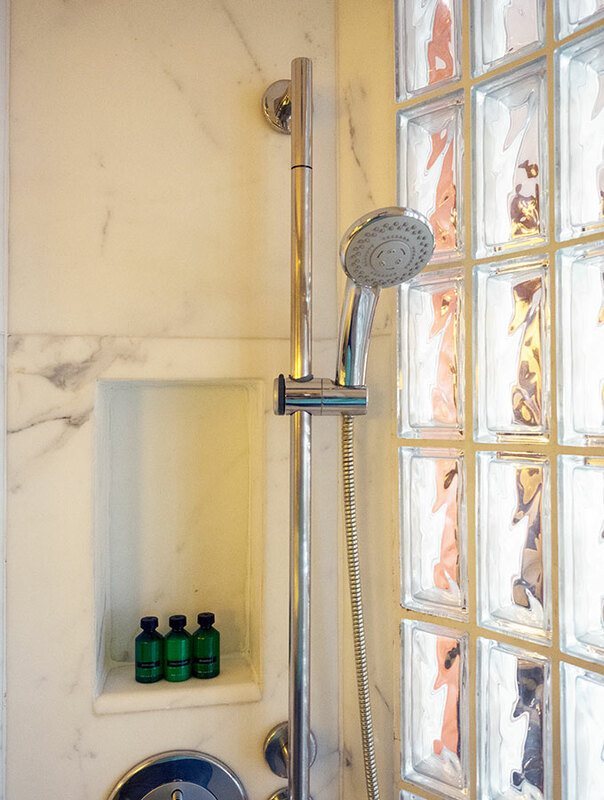 A large shower with a rain shower takes up a large portion of the bathroom. 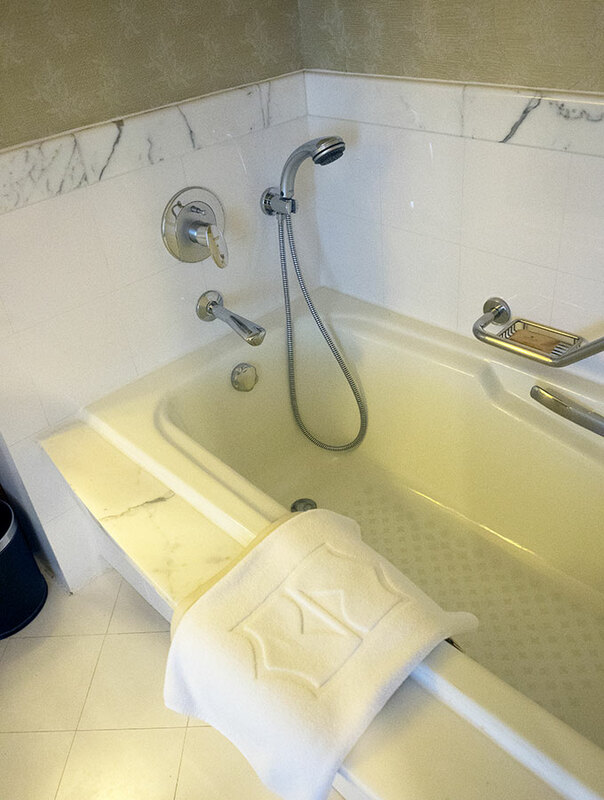 There is also a separate bath. The Shangri-La Hotel Bangkok don’t let me down, they include a clothesline to hang wet items if needed. Such a plus in tropical climates. Now on to that view! 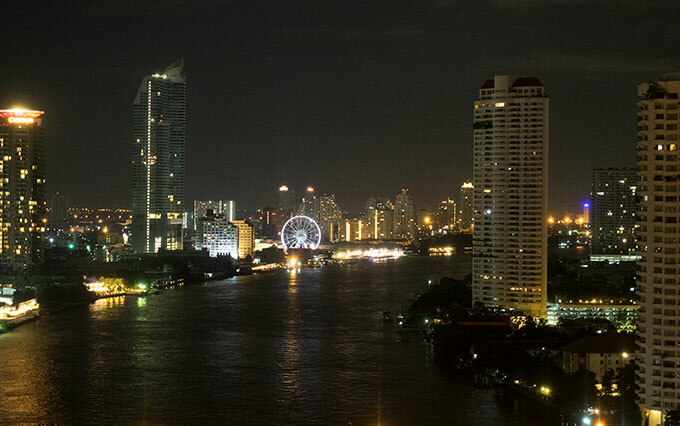 So stunning, a non obstructed view right up Chao Phraya River. It is a view you don’t get tired of morning, noon or night. 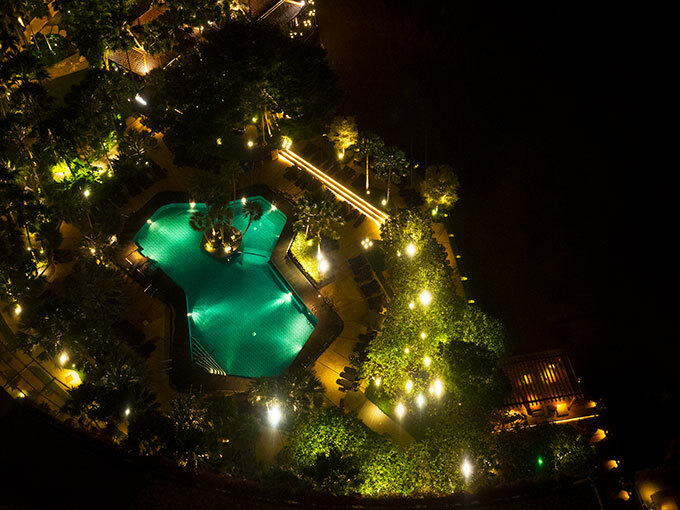 If you do decide to look down, you have a wonderful view of the hotel pool. 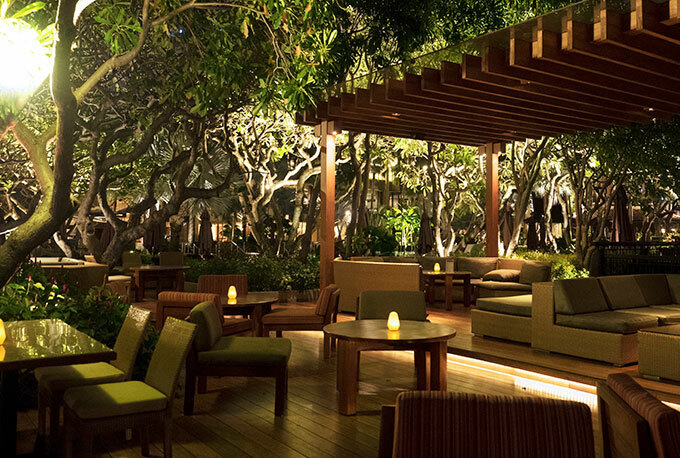 The Shangri-La Bangkok is a very large hotel with lots of areas to eat, drink and relax. 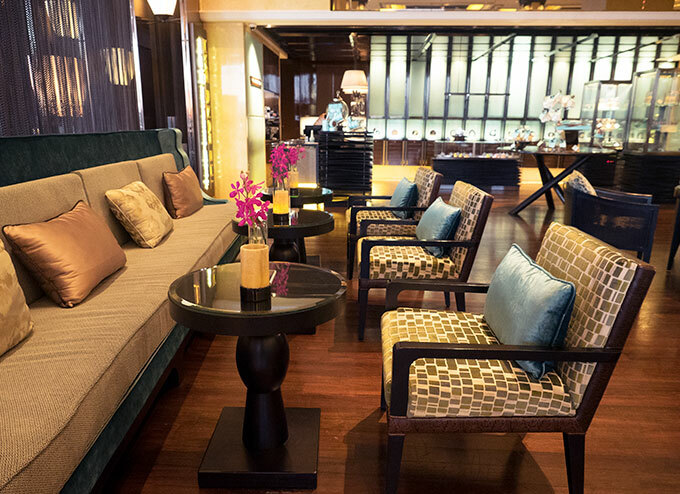 The best place to start is the Lobby Lounge. 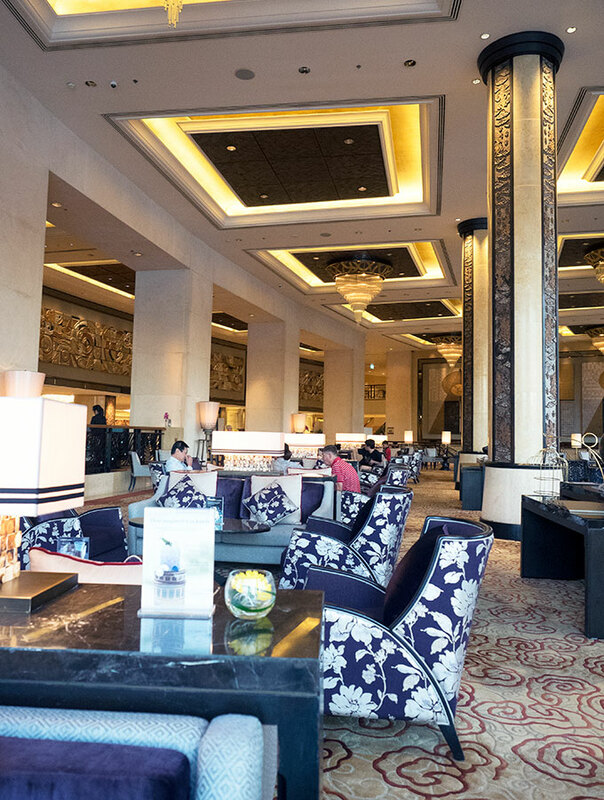 The Lobby Lounge is on the same level as reception and over looks the river and pool via gigantic glass windows. It’s known for its high tea, which sadly I didn’t have the chance to try. 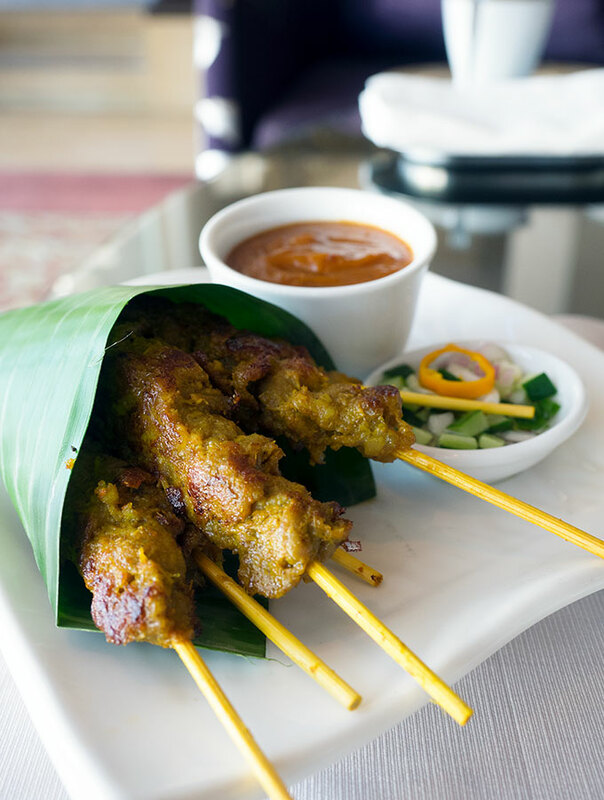 Though I did partake in a cocktail and some satay. 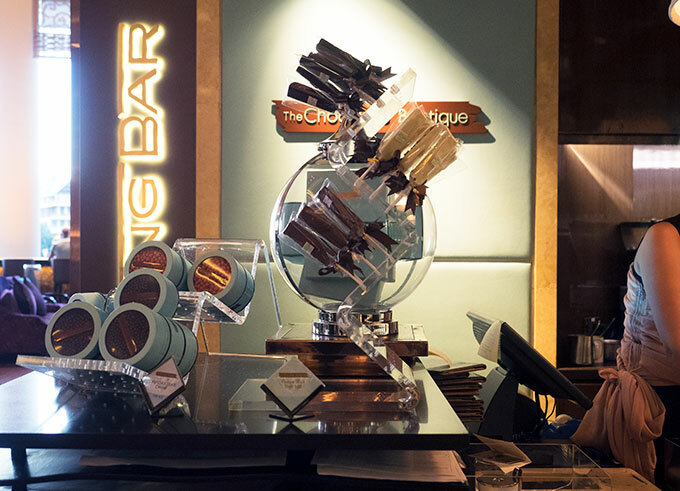 In an open plan style you will also find the Long Bar snuggling up next to the Lobby Lounge and the Chocolate Boutique right next door. 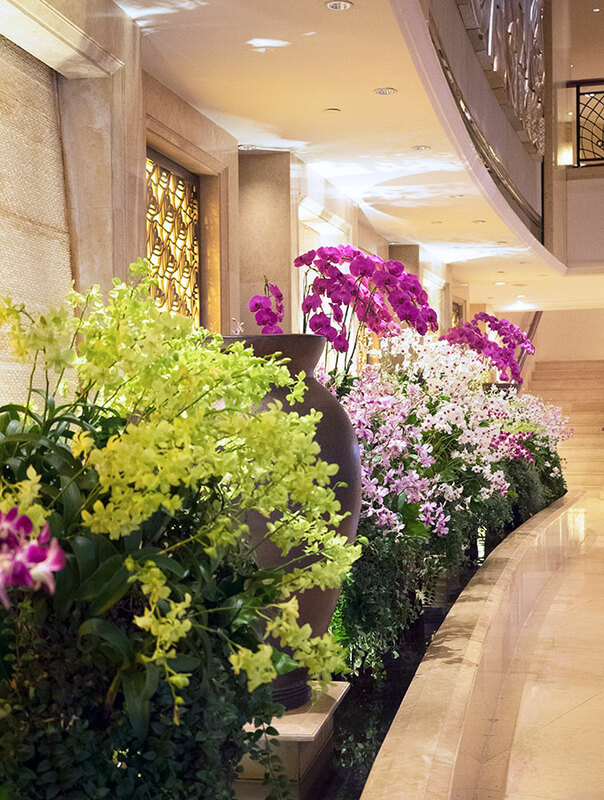 Plus you can’t miss the gorgeous orchids making a statement in the lobby. 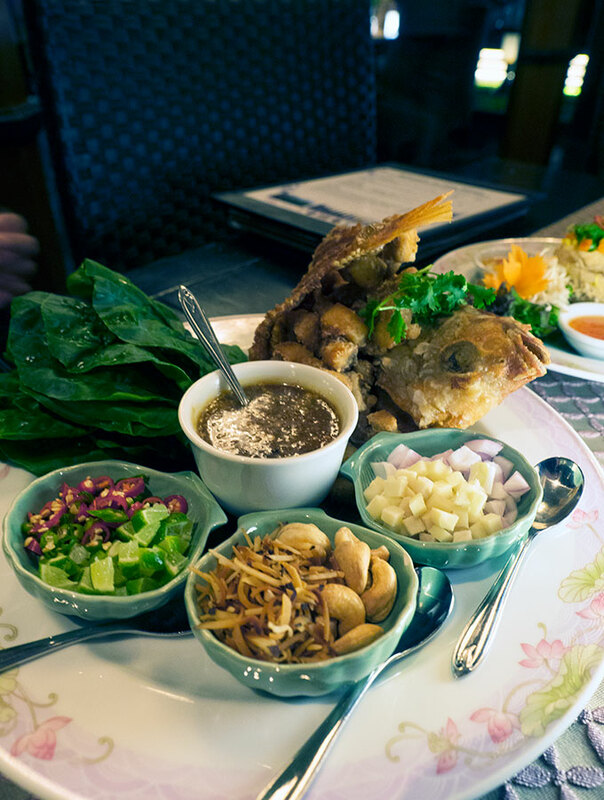 With so many places to eat, I’m going to give you a small taste of what is on offer at the Shangri-La Hotel Bangkok. I will also be covering a few of the restaurants in depth at a later date. Think of this as a tasty teaser. 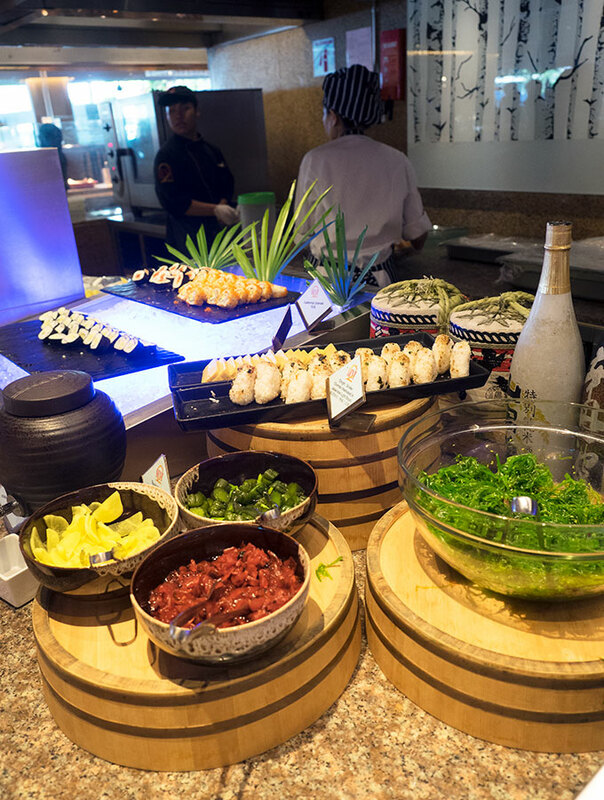 Next 2 Café: This is the hotel’s buffet restaurant and is the place to have breakfast, so much to choose from. Situated right next to the river you have a choice of dining inside in airconditioning or braving the weather and sitting outside watching life on the river. I think you could stay a week and still not try everything. 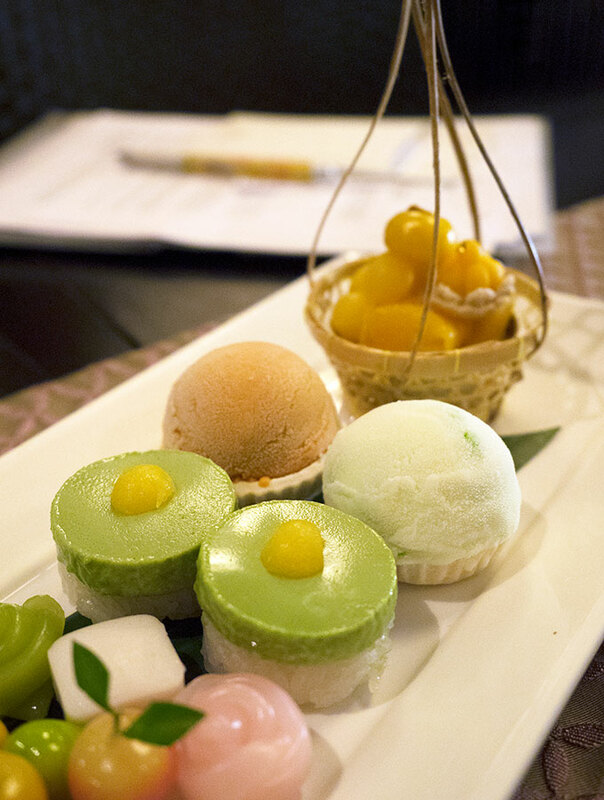 They even have ice cream and Thai tea on offer! 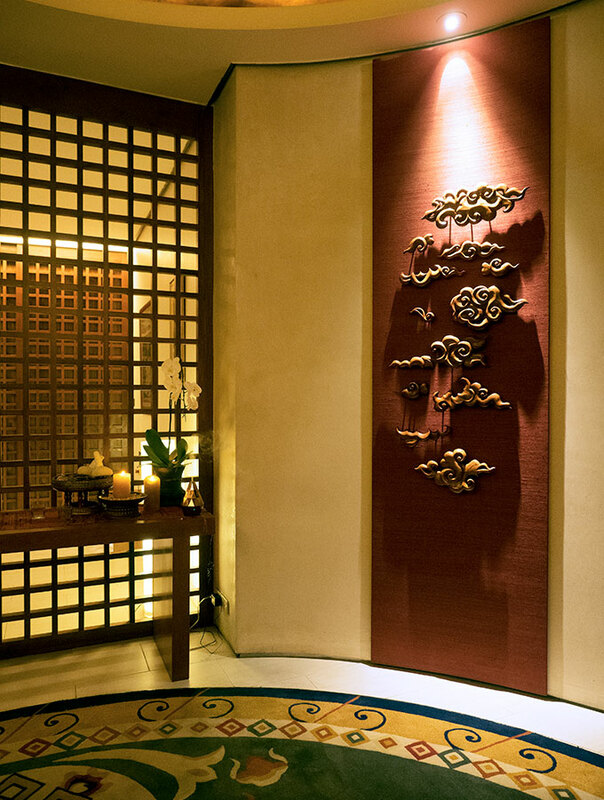 The Shang Palace: This is the hotel’s Cantonese restaurant. 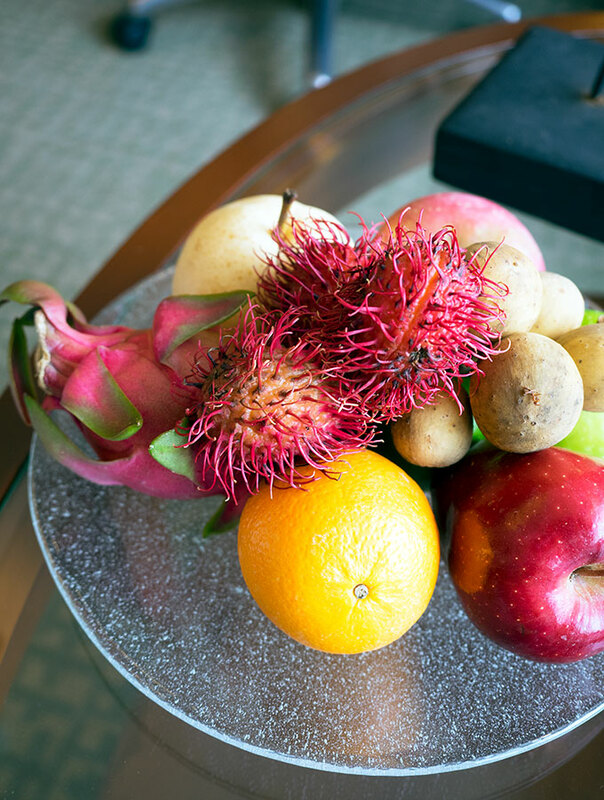 If you read about my stay at Shangri-La Hotel Singapore you may be doing a double take. 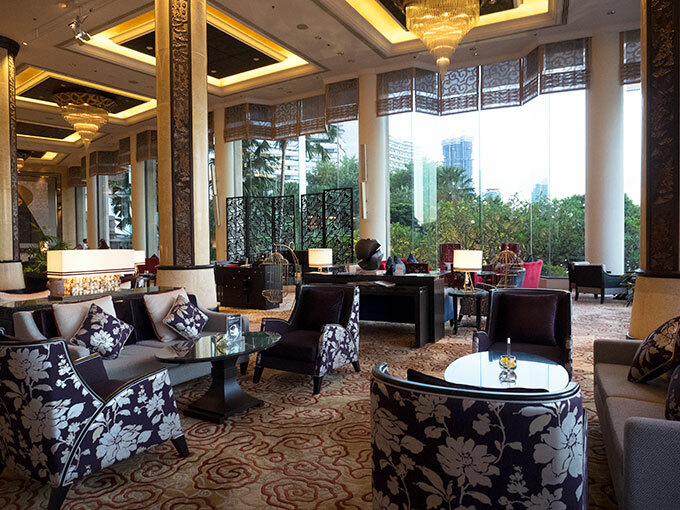 Yes, there is a Shang Palace at both hotels. We ate here a couple of times during our stay, a yum cha lunch and dinner. Such a grand restaurant with wonderful service. Another one to stay tuned for later down the track for an in depth look at the food. 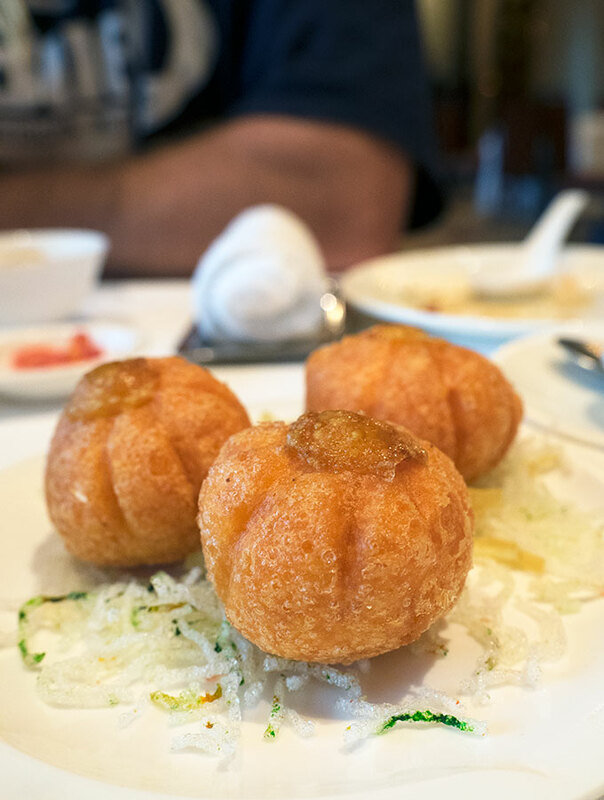 But I will say, amazing yum cha! 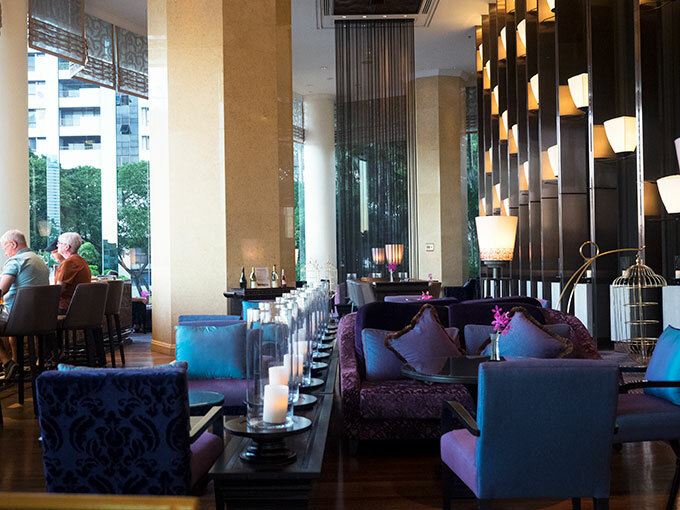 Salathip: This is the restaurant of Shangri-La Hotel Bangkok. 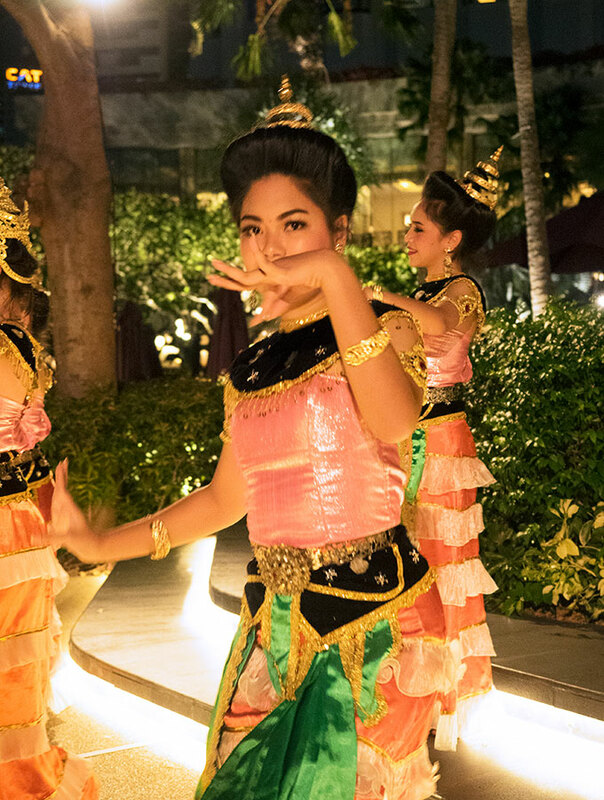 We enjoyed a wonderful meal here, along with traditional Thai dancers. 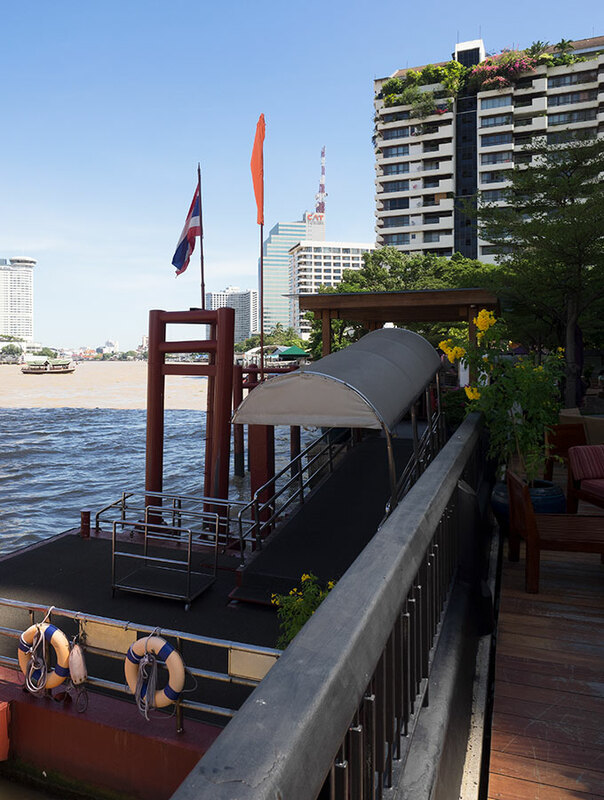 Salathip is located right on the river and is a stunning restaurant. 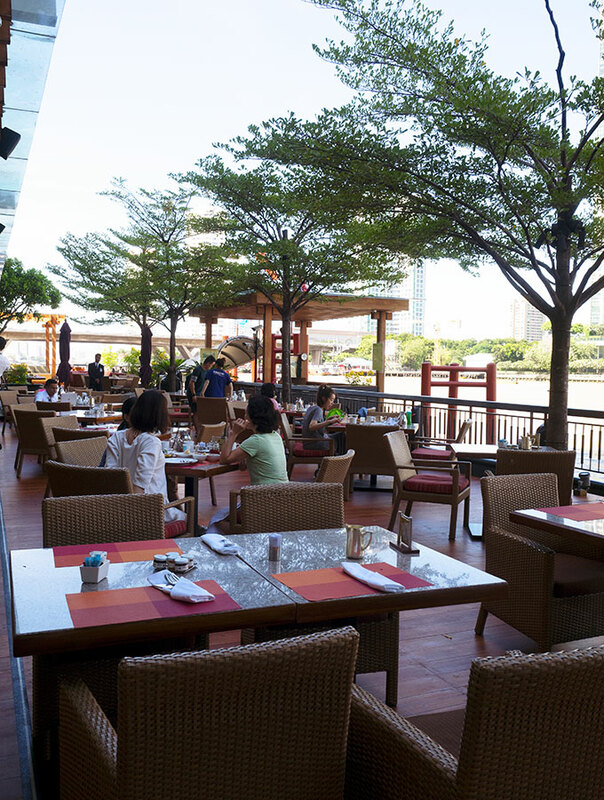 There is a choice of eating indoors our outdoors, with seating right along the river. Such a magical place to dine. I will also be sharing all the amazing dishes we tried a little later. 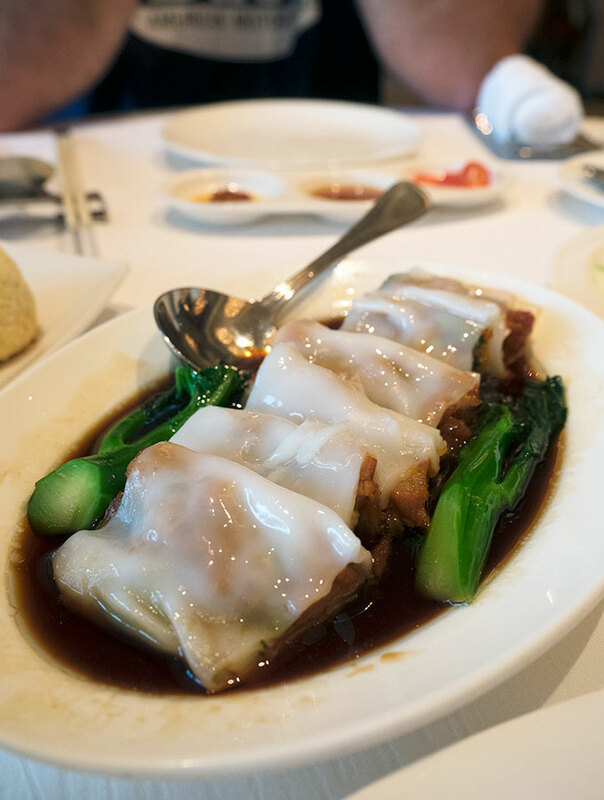 Other dining experiences offered are Horizon River Cruise, Volti Restaurant and the Riverside Lounge. Yes, I decided to have some spa downtime while I was at the hotel. The spa has won a slew of awards and I was treated like a little silkworm when I visited. 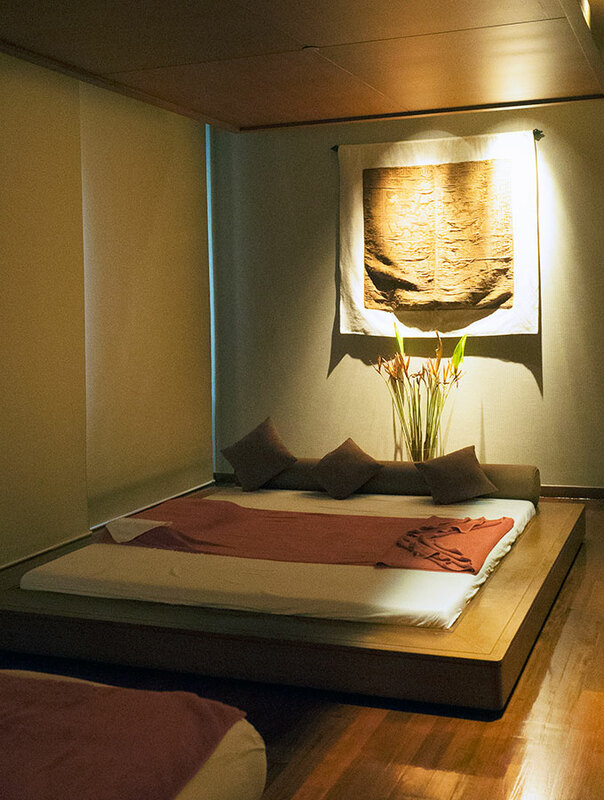 I decided to truly be pampered with a 90 minute body massage and 60 minute reflexology session. 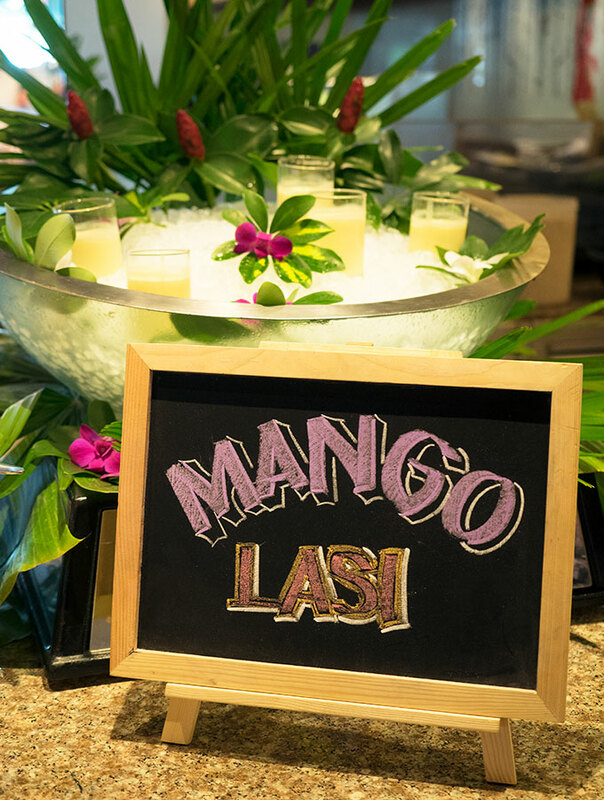 CHI use Panpouri products and they are also available for guests to purchase to take home with them. 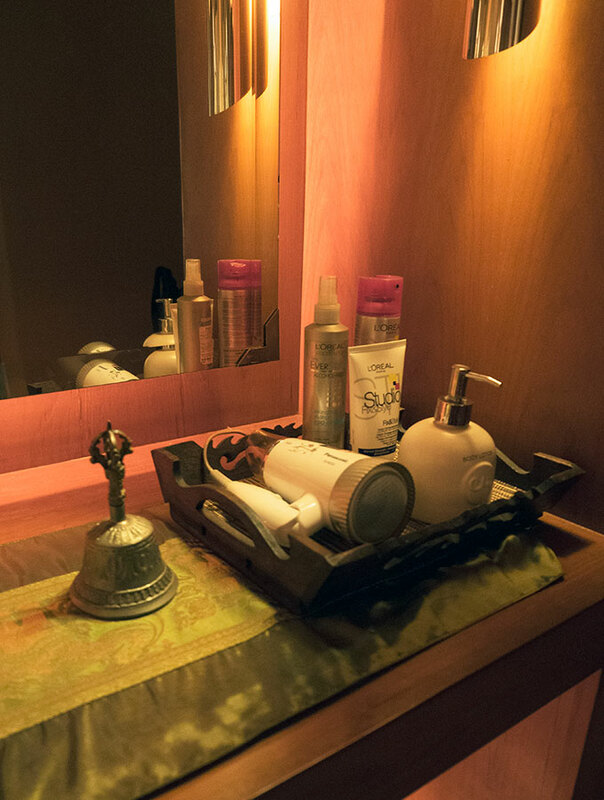 The spa rooms are spacious, and there is everything that you would ever need to freshen up after your treatments. 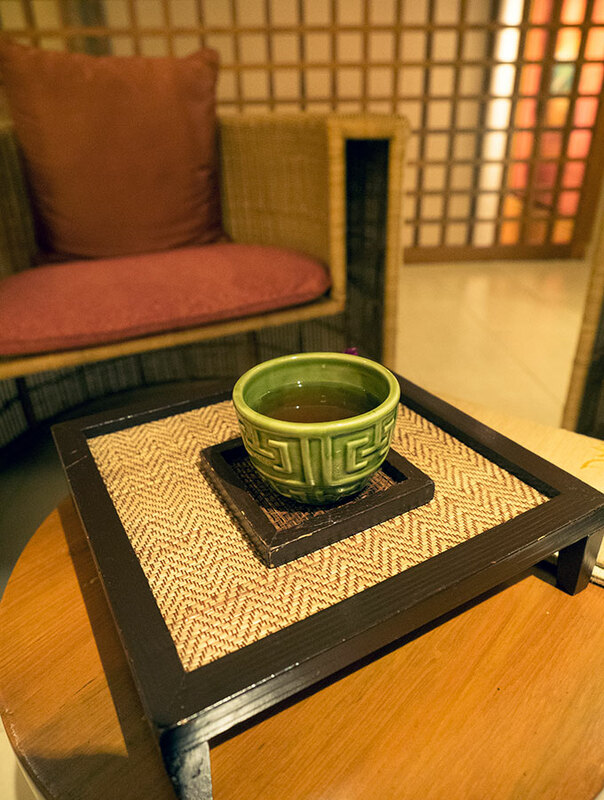 To help you acclimatise before heading off after your treatments, you will be offered a lovely cup of hot ginger tea. It was simply perfect after being pampered for over 2 hours in tranquillity. I floated the entire way back to my room. 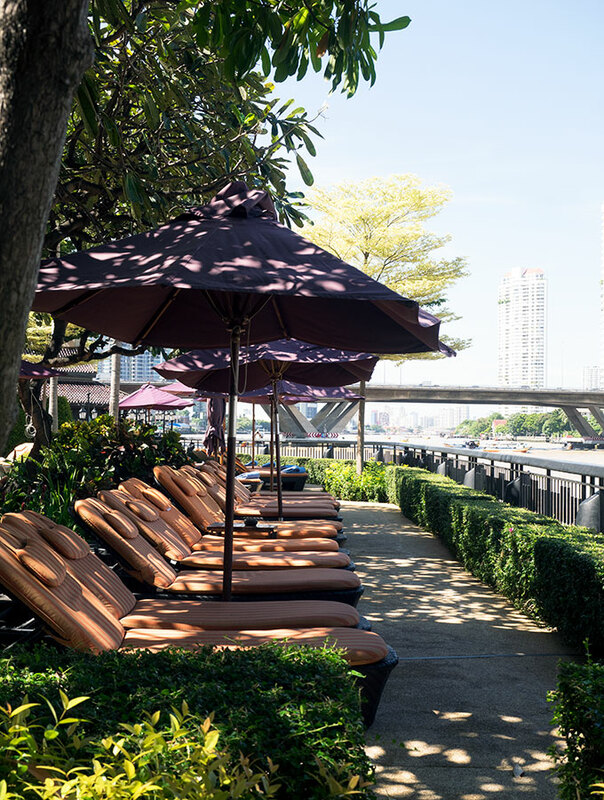 The Shangri-La Hotel Bangkok provides a vast range of areas to relax by the river. You can eat, drink, sleep or swim with the River of Kings in sight. 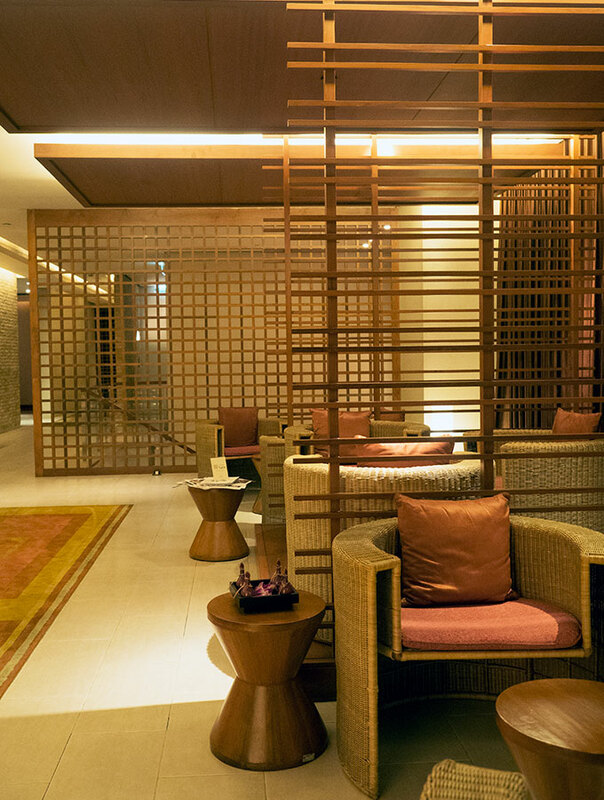 So many lounge chairs that you will find your spot of tranquillity. There are a few day beds dotted around as well. 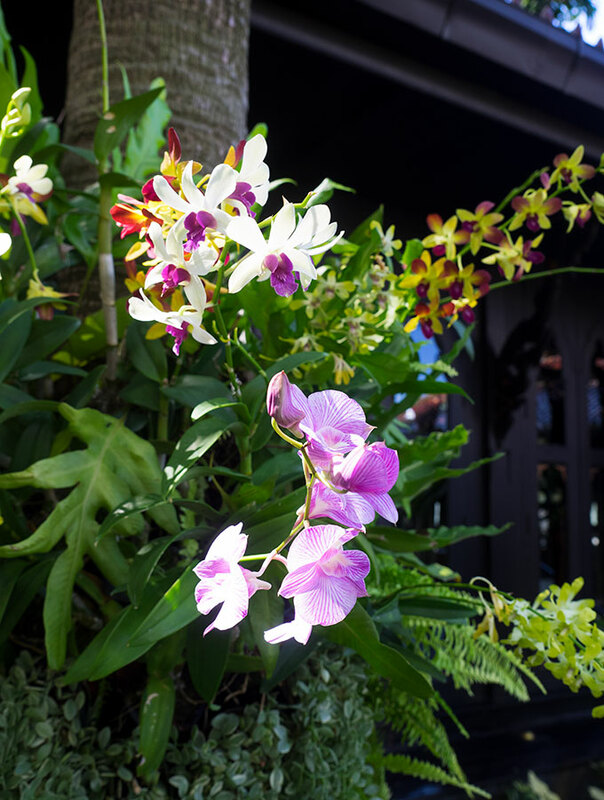 Orchids make their presence in the garden along with other lush tropical greenery. 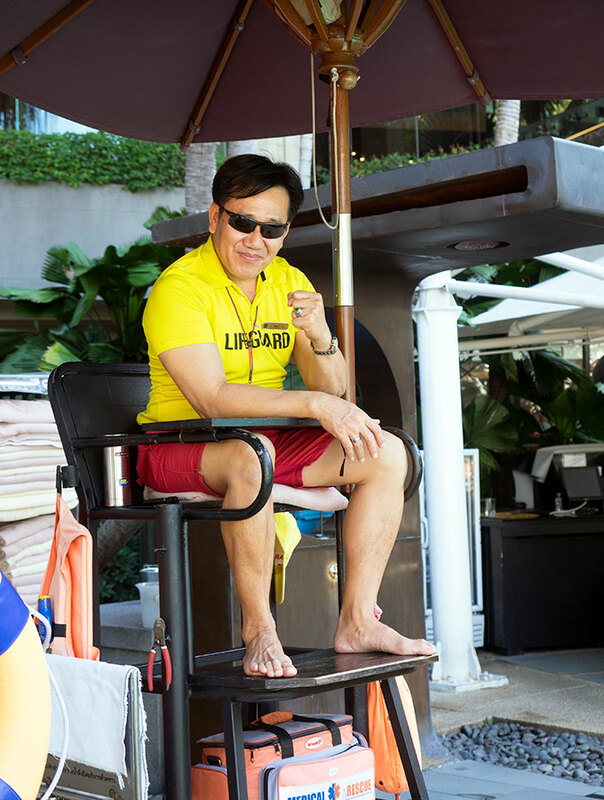 The pool is large with its own lifeguard at the ready to rescue you if needed. The lush gardens offer shade for those that don’t want to laze in the sun. It’s the perfect place for a cocktail or two and a good book. We found the Shangri-La Hotel Bangkok a great place to base yourself while we were staying in Bangkok. The ease of access to the BTS Station was a big bonus and made shopping trips easy and non-stressful. Plus you got to avoid the crazy Bangkok traffic. As you are located on the river you aren’t too far from the public ferry stop either. Belly Rumbles stayed as a guest of Shangri-la hotels with much thanks for 2 nights, the rest of the stay was personally paid for. The Shangri-La Hotel looks like a perfect base and definitely the sort of hotel I’d choose to stay in. Obviously the brand name is synonymous with excellent, but I still this the hotel looks like it takes it to another level. I can’t believe the bed head – it is so beautiful! 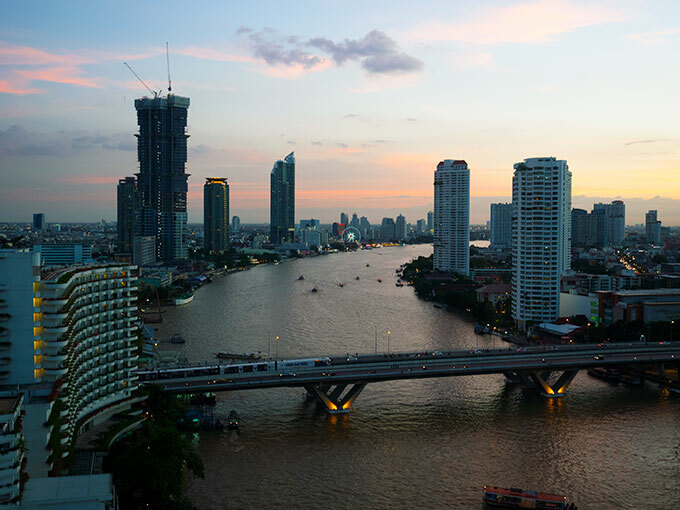 Bangkok is a vibrant city and it has so many stay options. When we were there we stayed in the heart of the city. But it would be great to stay in a hotel by the riverfront. 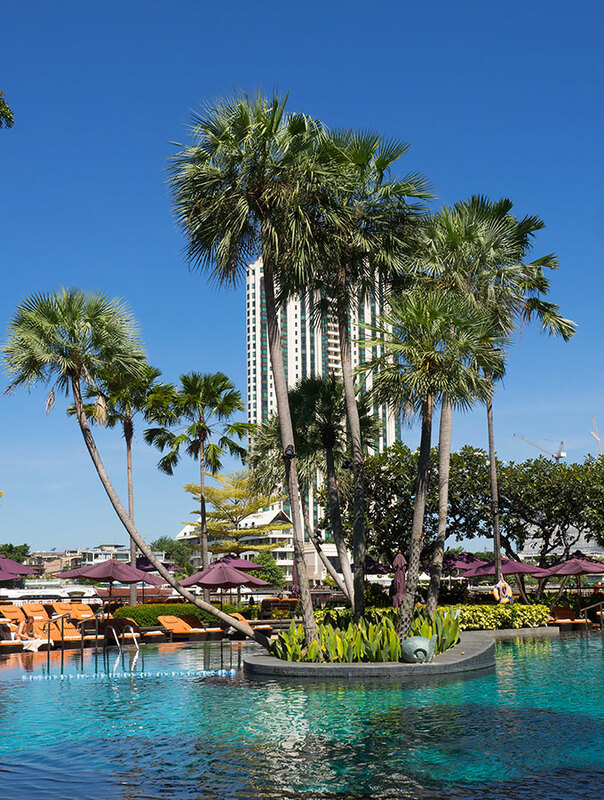 Shangri La hotel is known for its impeccable quality and service and the one in Bangkok seems to have the hallmark of the brand. The decor is indeed exquisite and the location is such that it would be a great place to wake up to. 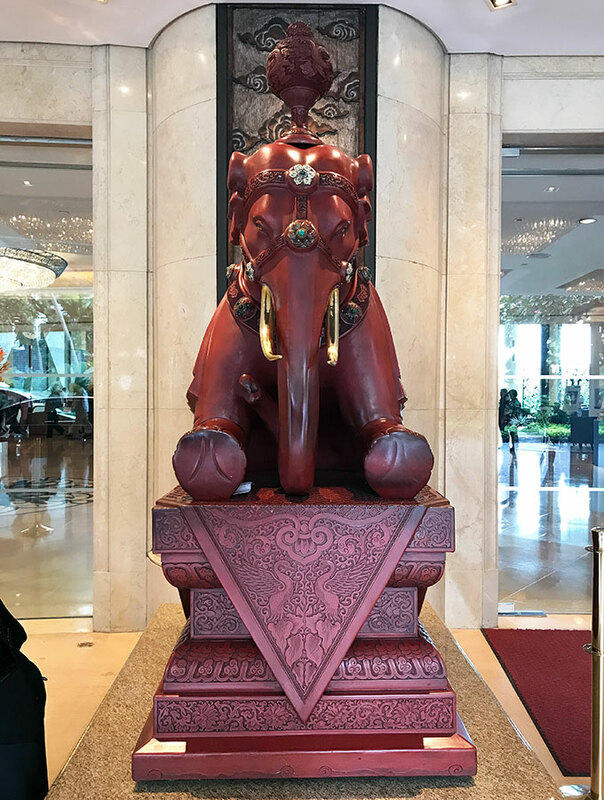 Shangri-La Hotel Bangkok sounds like it has everything; location , luxury, and I love the stunning interior – the room are incredible and I love how they’ve fused modern luxury with traditional décor. 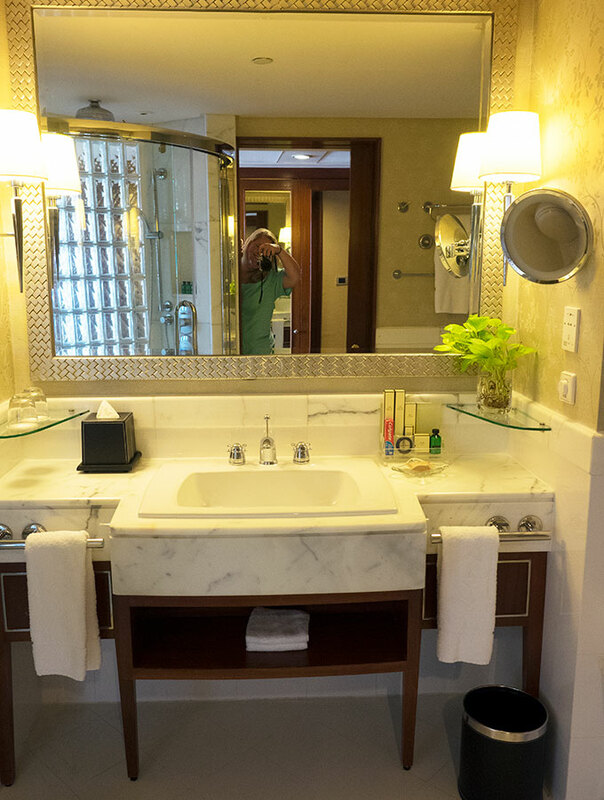 Beautiful bathroom too and you obviously can’t beat that view over the Chao Phraya River. Thanks for the review! Those views from the Shangri-La Hotel are amazing, day or night! 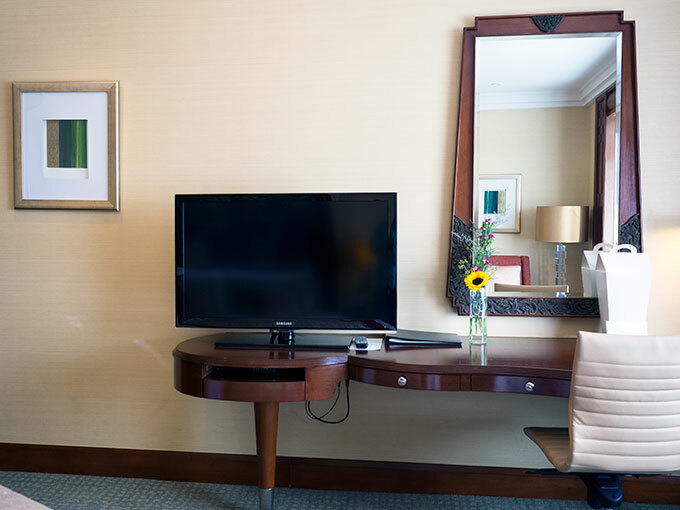 The rooms and lobby look very classy and comfortable. I’m impressed by the amount of eateries on offer there too; I think I’d have to try each one! The outdoor areas and pool look lovely – the perfect place to wind down after a day of sightseeing and shopping! Gorgeous views from your room. Add all the good food, a great spa and pool and the fancy lobby area, I am sold! Your photos are stunning! It all looks fantastic, but then I’ve yet to see a Shangri-la that doesn’t stand up to its luxurious name. I also cut my teeth on ‘modern’ hotel security at the Shangri-la in Manila. It’s a good thing you mention that, because it can be a bit of a shock. This is stunning beyond words! The interiors look so comfortable and loved the furnishings a lot. Food at the restaurant is most tempting.The pricing is high but rightly so. Need to save up a lot for such luxury travel. The Shangri-La looks a great place to stay, our sort of hotel. Would love to stay there when visiting \Bangkok. If it’s anything like our visit to the Shangri-La Hotel At The Shard in London, it will be a wonderful experience. Beautiful pictures and what an experience! I stayed at a Hilton when I was there but would love to explore more five star accommodations like this. Must return with a fatter wallet! What a gorgeous hotel! 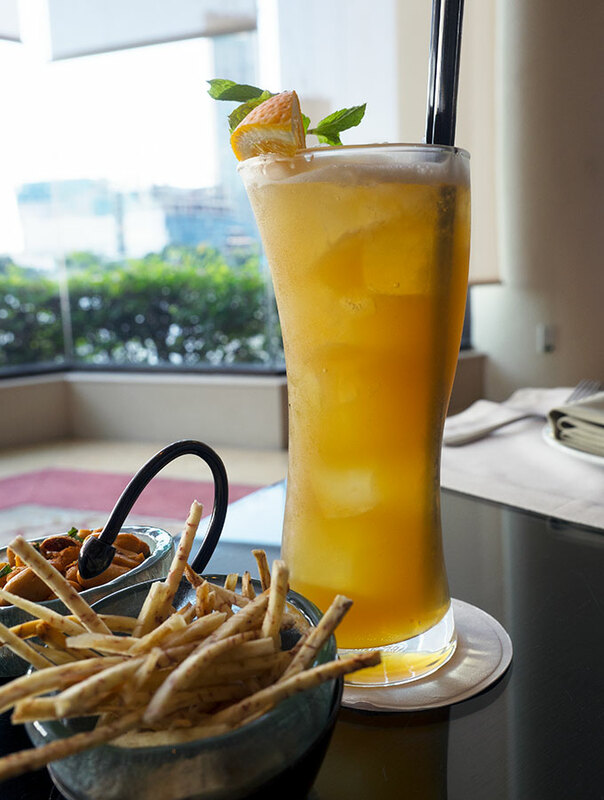 Reading about all the food the restaurant serves makes me miss Thailand, especially the Thai iced tea! I stayed in a hostel when I was backpacking through Bangkok, but next time I go I’d love to stay in a luxury hotel like the Shangri La!